These no-holds-barred wireless headphones are oozing with positive qualities, but, at $500, they're almost prohibitively expensive. If you're an audio lover that can spare the expense, do not hesitate on this comfortable, hard-working set of headphones that will likely survive for years. If a product's name defines its character, Sennheiser's line of Momentum headphones is a force to be reckoned with. But what's in a name? After all, it's the quality of the product itself that matters most. Thankfully, Sennheiser has put forth a brilliant, modern effort for cord cutters and music die-hards alike with its Momentum Wireless Bluetooth headphones. 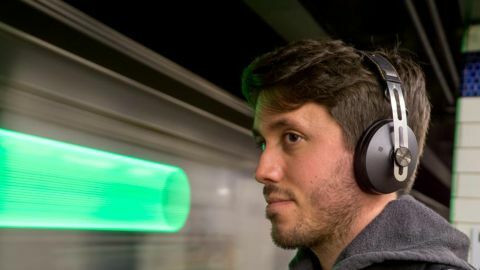 They may be a bit on the pricey side at a staggering $499 (£379, about AU$642), but they deliver some of the best audio over Bluetooth we've yet to hear - which is why you'll find them on our Best Wireless Headphones list. In the time since their release in 2015, few headphones have come to challenge their position as top dog. There's the Sony WH-1000XM2, which offers noise-cancellation and Hi-Res Audio support for a little less, but they lack Sennheiser's neutral sound signature. If pristine sound quality is what you're after and you don't mind paying a bit more for it, the Momentum Wireless remain one of the best options out there. The headband of the Momentum Wireless is sandwiched between different textures of leather for comfort and - hey, these are $500, so what the hell. The bottom of the headband is coated in a leather that feels like it belongs on a deluxe ottoman, while the top feels like a ruggedized wallet. Stainless steel sidearms are attached to the leather headband by hinges that offer stability, style and a satisfying fold-up action. These "collapsible sliders" as Sennheiser calls them, are durable and have an inherent ability to bend, enabling the Momentum Wireless to achieve the ideal fit. The closed-back earcups house the finest detail found on the Momentum Wireless. Fastened to the steel rails with a ball joint - complete with spun metal and prismatic branding - the cups offer up a good amount of movement. However, those who enjoy twisting earcups to better rest around your neck might be disappointed in their lack of that ability. The review model provided to TechRadar is the aptly titled "Black" color, but the outside of the cups deviates a bit with beautiful matte, gunmetal grey paint. This smooth look transitions into a glossy plastic ring that you'll find on each cup, bringing a load of microphones and buttons into the mix. Aside from a few microphones that aid in active noise cancellation, there's not much to see on the left cup. Moving over to the right cup, the list of features grows: micro USB for charging, 3.5mm input for wired listening, power/Bluetooth discovery and a multi-function button with volume rocker. These functions are integrated discretely, following the premium appearance set by the other components. Also included with the purchase is a leather carrying case. It's not a hard case, but the durability is up to snuff to carry your new car payment. There's also a thin, silky bag that offers the headphones more travel-friendly protection. Tucked away are a few last trinkets: a charging cable, 3.5mm audio cable and in-flight converter. The Sennheiser Momentum Wireless make a stellar impression before you even power them on. The ball joint earcups don't move an inch once they wrap around your ears. The headband's underside provides the perfect amount of support. Nothing more, nothing less. The feel and build quality are up to par with what I'd expect if I shelled out large portion of my rent for a set of headphones. But a surprise I wasn't expecting is how lightweight it is. Somehow, this hodgepodge of classy materials doesn't weigh it down. As such, comfort was never an issue. The leather-covered memory foam ear pads are incredibly comfortable and I'd be content keeping these on all day. Battery-savers will find the wired option to be convenient, but you can also turn the headphones on to activate active noise cancellation. This is handy to use while wired into devices that aren't Bluetooth-capable, like the New Nintendo 3DS. Speaking more on the active noise cancellation, it's not the most isolating effect I've ever heard but it's plenty sufficient. What's great is that it doesn't dampen the sound quality. I found that the sound in the Bose QuietComfort 25, while fantastic, fell flat behind the strong effect of the active noise cancelling. Listening to music through these headphones is a glee-inducing experience. Piggybacking off the comfort of the Momentum Wireless, the sound is flooring. For the price, these headphones deliver sound quality that trumps every set of Bluetooth headphones I've tested yet. A tour through some of my favorite tracks put the best traits of the Momentum Wireless on display. The bass response "A tout a l'heure" by Bibio, for example, is articulate, punchy and never overbearing. The mids and highs are pitch-perfect and never get lost in the sonic splendor put forth by these headphones. Lots of little touches try to help the Momentum Wireless justify the price. A helpful vocal assistant - with a British accent, of course - even chimes in to notify you of the Bluetooth connectivity status. The battery life is remarkable. Claiming an industry-leading 22 hours of performance off a 3 hour charge, the Momentum Wireless nailed it. I couldn't kill it no matter how hard I tried during a 15-plus hour evaluation. These headphones are a delectable blend of premium build material, peerless design and sound performance. Once you swallow the price, you're in for a real treat. Every little aspect of these headphones deliver to their fullest. I'm nit-picking here, but the multi-function button can be fidgety at times. Tapping it twice or three times to change songs requires more effort than it should. The price as the Momentum Wireless splashes onto the market is awfully high. It creates a high barrier to entry that will likely see those on the cusp of buying a set of over-ear headphones opting for cheaper options out there. Sound enthusiasts know that Sennheiser can bring the house down. But with the Momentum Wireless, here's to hoping that more discover these truly incredible wireless headphones. However, at such a premium, it's likely that only the fortunate few ever will. Sennheiser's asking price is no doubt a bitter pill to swallow. You can more affordably satisfy your wireless over-ear fix with the Koss BT540i for $199, or get excellent active noise cancellation with the Bose QuietComfort 25 for $299. However, if stellar sound performance and brilliant craftsmanship are your bag, the Momentum Wireless basically pay for themselves.